Barnes stayed in Kansas City for a while and developed a small bootlegging business. It was here that he began calling himself George R. Kelly. Working with several partners Kelly expanded his bootlegging operation into Texas, Oklahoma, Tennessee and Mississippi, and eventually into New Mexico. On March 14, 1927, Kelly was arrested in Santa Fe on bootlegging charges, and served several months in state prison. After his release, he traveled to Tulsa, Okla., where, on July 24, 1927, he was arrested for vagrancy. His next arrest was for selling liquor on an Indian reservation. This constituted a federal crime, and Kelly was sentenced to three years in Leavenworth. His career in crime was about to move into the fast lane. In Leavenworth, Kelly was befriended by bank robbers Charlie Harmon, Frank "Jelly" Nash, Francis "Jimmy" Keating and Thomas Holden. 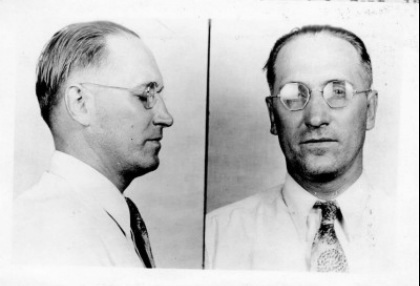 Using forged trusty passes Keating and Holden walked out of the federal prison in late February 1930. Prison officials later accused Kelly and Harmon, who worked in the photography department of Leavenworth's record's section, of helping with the forgeries. Keating and Holden headed for St. Paul, which, along with Kansas City and Hot Springs, Ark., were considered "safe cities" for underworld figures because of their corrupt city government. Nash would also escape from Leavenworth later that year and he, too, headed for the safety of St. Paul. When Harmon was released in 1930, he joined Holden and Keating’s bank robbing gang. In November 1931, Harmon was killed robbing a bank in Menomonie, Wis. His widow, Paula "Fat-Witted" Harmon, would later become the girlfriend of bank robber Freddie Barker, brother of Arthur "Doc" Barker and longtime associate of Alvin "Old Creepy" Karpis. When Kelly was released in 1930, he also headed to St. Paul. On July 15, 1930, Keating and Holden showed their gratefulness to Kelly for his help in their escape from Leavenworth by inviting him to participate in robbing the Bank of Willmar, Minn., a small town about 100 miles west of St. Paul. Also at the robbery was Harvey "Old Harv" Bailey, Verne Miller and Sammy Silverman. The gang stole an estimated $70,000, but it was not a clean robbery. The head of Minnesota's Bureau of Criminal Activity claimed, "I can't remember a holdup in the history of the state since the raids of the Younger Brothers and Jesse James gangs which compares to the one at Willmar for daring and cold-blooded disregard of human life." During the robbery a cashier was pistol-whipped, and when a group of onlookers formed outside the bank, one of the gunmen unleashed a burst from his tommy gun into the crowd, wounding two women. And the violence continued. Kelly continued to participate in other bank robberies. In September 1930, he helped rob a bank in Ottumwa, Iowa, with a group of bandits including Holden, Keating, Bailey, Miller, Fred Barker and Larry DeVol, another associate of Karpis. On April 8, 1931, Bailey, Nash and Miller headed a group of robbers that took $40,000 from the Central State Bank of Sherman, Texas. Kelly met the men near the Louisiana border in a second getaway car. During this time, Kelly and his new wife, Kathryn, whom he had met shortly after his release from leavenworth, were living at the home of Kathryn's former husband, Charlie Thorne, in Fort Worth. Kelly continued to work with Keating, Holden and others until early 1932 when he met, and began working with Albert L. Bates. How they met is not known, but they would work together for more than a year. Bates had an arrest record dating back to March 1916 when he was convicted of burglary and sentenced from one to 15 years in the state penitentiary at Carson City, Nev. Paroled a year and a half later, his next sentence was a six-month stretch for petty theft in Salt Lake City. In August 1921, Bates received another sentence for burglary in the Utah State Penitentiary. He escaped in October, 1926, but less than seven months later he was serving a three to five year burglary sentence in Colorado. After his release in July 1930, Bates made his way to the Midwest and spent 30 days in jail on a minor charge in Michigan. At one time, Denver police considered him a suspect in the murder of two of his accomplices. In September 1932, Kelly, Bates and Eddie Bentz, a seasoned bank robber, traveled to Colfax, Wash., near the eastern edge of the state, where, on Sept. 21, they robbed the First Trust & Savings Bank of Colfax of $77,000. Within weeks, police raided the Kellys' home in Fort Worth, but the couple had already had fled. Bentz was arrested a short time later in a Dallas post office. He admitted to knowing Kelly and Bates, and acknowledged they had a hideout on a ranch somewhere in Texas, but denied any involvement in the Colfax robbery. When Bentz was able to make bail, he fled the state. Kelly's last known bank robbery occurred Nov. 30, 1932, when he, Bates and a Chicago hoodlum named Eddie Doll, robbed the Citizen's State Bank of Tupelo, Miss., of $38,000. After the robbery the bank's chief teller would say of Kelly: "He was the kind of guy that, if you looked at him, you would never thought he was a bank robber."